Does Adderall Make You Depressed? Adderall can stimulate your central nervous system mainly because it uses a combination of dextroamphetamine and amphetamine. Generally used to reduce hyperactivity, it also helps improve attention span, which is why it is often prescribed to treat narcolepsy or ADHD. While it is a common drug, many people have concerns regarding its side effects. Does Adderall cause depression? It is something that worries many people. Let's find out more about it. Adderall affects certain brain neurotransmitters, such as norepinephrine, dopamine, and serotonin. Taking Adderall may help treat ADHD, but it can also create a feeling of high, especially when administered in larger doses. Due to this effect, Adderall is also among the most commonly abused drug. It makes you feel euphoric when you do not have ADHD. People who are not suffering from ADHD may also notice an increase in concentration and focus. The downside is that you may also feel anxious and experience severe headaches. Other side effects include nausea, increased blood pressure, and changes in heart rate. It is worth mentioning that you are likely to experience withdrawal effects when the effects of the drug wear off. The effects are quite the same as cocaine. The most common symptoms of a crash include sluggishness, sleep problems, and anxiety. Does Adderall make you depressed? It possibly can. The reason is that it alters your brain neurotransmitters, which is why you are likely to deal with mood disorders such as depression, extreme hunger, anxiety, and cravings for more Adderall. Some people may also experience symptoms, such as unhappiness, fatigue, irritability, feelings of emptiness, and panic attacks. Since there is always a risk of causing depression, healthcare providers usually start with the smallest dose of Adderall. They increase the dose gradually until you experience the desired results. Administering Adderall in this way lowers risk of withdrawal effects. You may also be able to manage its effects more effectively when you take it at regular intervals instead of taking all at once. You may also benefit from taking the extended-release version of the drug. 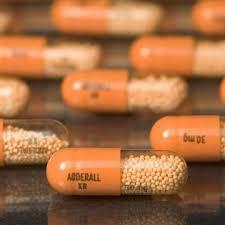 At high doses: Taking higher doses of Adderall are likely to cause problems other than withdrawal. It may cause chronic intoxication, which leads to feelings of excitement and euphoria. You may experience other side effects too, such as irritability, insomnia, hyperactivity, and changes in personality. In rare cases, it can also cause sudden cardiac arrest or psychosis. At prescription doses: Even when you take Adderall at prescription doses, you may experience certain side effects depending on your age. In children between 6 and 12 years of age, Adderall can cause problems like insomnia, loss of appetite, fever, stomach pain, insomnia, nervousness, nausea, and vomiting. Teens are likely to deal with side effects, such as stomach pain, insomnia, loss of appetite, weight loss, and nervousness. Common side effects in adults include sleep difficulty, loss of appetite, anxiety, nausea, agitation, dry mouth, fast heart rate, weakness, dizziness, and urinary tract infections. Keep in mind that Adderall is not safe for everyone, and you should avoid it especially when you have some pre-existing health conditions. Stay away from the drug if you have hypertension, heart disease, glaucoma, hyperthyroidism, and hardening of the arteries. Do not take the drug if you are pregnant because it can cause low birth weight or even premature birth. You need to remember that Adderall can also interact with other medications, both OTC and prescription drugs. Therefore, you should take it under the strict supervision of your healthcare provider. Be sure to talk to your doctor immediately if the crash happens. Your doctor will help you understand how you stop taking the drug in an efficient way. Dealing with the negative effects of Adderall is not easy. Therefore, you need to ensure that you take special care when taking it for any health condition. Here are some simple ways to lower risk of experiencing the Adderall effects. Be sure to take in smaller doses only. If you have to take it daily, it is important that you do not start with larger doses. Many people have confirmed that they manage to get a good effect even when they take a low dose. Work as per a plan to lower side effects of Adderall. For instance, you may want to take it close to bedtime, so you may already be sleeping when the effect begins to wear off. It will help prevent a major crash. Be sure to exercise regularly. It will help encourage the release of dopamine, which will lift your mood and lower your risk of dealing with anxiety and depression symptoms after taking Adderall. Keep yourself occupied. Keeping yourself busy will help cope with the crash and lower the intensity of the side effects of Adderall. You may find it difficult to concentrate while experiencing a crash, but you should push yourself hard. Even if you could get the basic tasks done properly, it will help keep you busy. Take special supplements to avoid dealing with side effects of Adderall. For instance, you may feel better by supplements that contain l-tyrosine. It will improve your energy and make you feel a little less lethargic. Some people have found magnesium supplements to be especially beneficial to avoid and manage a crash associated with Adderall use. Sometimes, taking other stimulants like caffeine may make it easier to manage side effects of Adderall. Can You Overdose on Antidepressants? What Are Non-Drowsy Antihistamines? How They Work? Looking for Beta Blockers? 10 Best & Natural Options!